This video short from Jason du Pont details how to identify Native Brook trout, Wild Brown trout and stocked Rainbow trout found in the Gunpowder river. 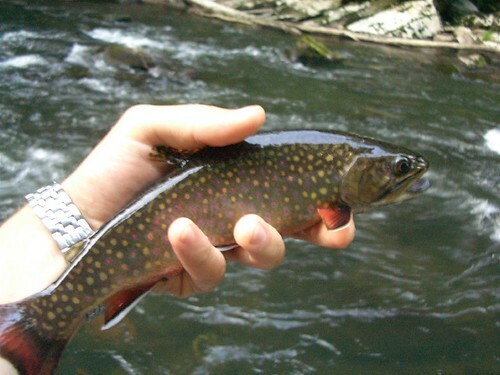 Characteristics of Pennsylvania stocked and Native Brook trout are also discussed. This entry was posted in video on May 29, 2007 by Theaux Le Gardeur. Memorial day weekend is over. Water flow on the Gunpowder river is 84 CFs and clear . Morning water temperatures at Falls Rd are still in the 63-64 F range, and afternoon Gunpowder river water temps have been on the rise. Yesterday afternoon a water temperature of 72 F was reported just above the high trail pool. Further downstream, at Big Falls Rd, a reading of 70F was recorded this morning, a little more than 6 miles below the dam. What’s going on with the water? To answer this loaded question I’ve used excerpts from the fishing report blog archives to give water temperature and fishing for Memorial day weekend a historical context. 2007: The Gunpowder river is clear and flowing at 85 Cfs.Water temps at Falls Rd through Masemore are 63 to 64 F. We’ve had Caddis and Sulphurs for a solid two weeks now. 2005:The river is in great shape. It is clear and at 120 Cfs. Dave just stopped in to report seeing a hundred and fifty rises in about an hour and a half yesterday at Masemore. He’s been fishing the river for 25 years and is out today enjoying the sunshine. 2004:These fishing reports were to good to keep to myself…Thanks to Russ and Greg for submitting them for all to enjoy. 2003:Currently the gauge at Falls Rd. reads 2.3 and flow is 201CFs, water temp is 50F and the water is a little off. Yesterday lots of anglers were casting to rising fish as the Sulphurs made their presence known. Note:In 2004 and 2005 water temps recorded during the same week of the related posts was in the high 50’s in 2004 and 52-54F in 2005. 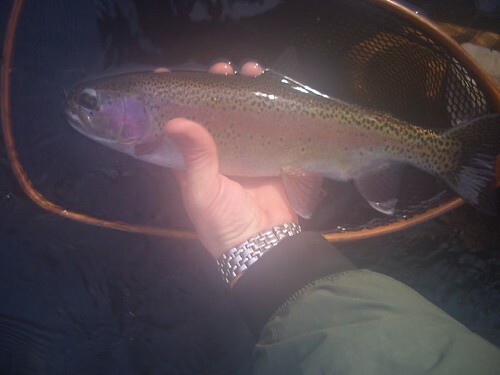 The trend of warmer water temps flowing in the Gunpowder river the past two years has allowed for larger and more varied hatches, (more species) faster growth rates among the wild browns and stocked Kamloops rainbows, and more enjoyable wet wading. Oh, about the insects…we’re still seeing Caddis, sized #16-18 and Sulphurs in the #12 to #16 range sporadically throughout the day, but mostly mornings for caddis as the river is cool and late evenings for ulphurs as the water is cooling from Falls Rd through Bunkerhill Rd access points. Midday fly fishing has not been as productive but with a gate change in the works this week we should get back to a more traditional emergence of Sulphur duns and caddis from 2:00 till 6:00 PM with Sulphur Spinners returning around dusk through dark. This entry was posted in fishing report on May 29, 2007 by Theaux Le Gardeur. Please join us for a Backwater Angler Overnighter. Fly fish the Savage River and the North Branch of the Potomac River with a Maryland Licensed Guide. Enjoy an overnight stay in a streamside cabin and have three meals on us! This entry was posted in events on May 27, 2007 by Theaux Le Gardeur. Please join us for a fly fishing skills clinic on Tuesday June 5th at 5:30 PM. Backwater Angler Guide Jason du Pont will be teaching an entomology clinic that is ideal for intermediate to advanced anglers. The clinic covers basic entomology, insect identification and fly selection. Cost is $75 per person. Class size is limited to 4 and pre-registration is required. Please give us a call at 410-329-6821 or drop us a line at info@backwaterangler.com to pre-register. The shop will be open Saturday, Sunday, and Monday from 10:00 AM till 4:00 PM. Stop by and see the show! This entry was posted in news on May 25, 2007 by Theaux Le Gardeur. 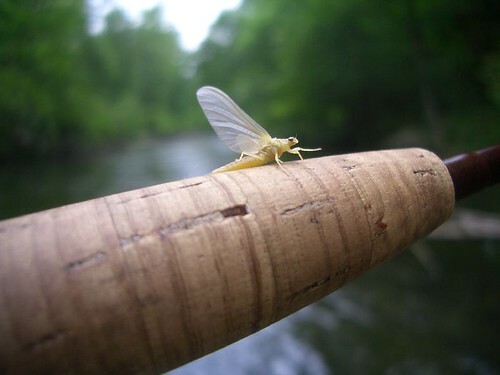 This video short by Jason du Pont describes fly fishing in Maryland for the week of May 22, 2007. In this episode, we give an introduction to fly fishing Loch Raven Reservoir for pickerel, largemouth bass, smallmouth bass, and black crappie. Many beautiful warm water game fish are released and tips on fly fishing the reservoir are discussed. Loch Raven is a great place for anglers to target bass, panfish and pickerel with flies. This entry was posted in fishing report, video on May 24, 2007 by Theaux Le Gardeur. The Gunpowder river is clear and flowing at 85 Cfs.Water temps at Falls Rd through Masemore are 63 to 64 F. We’ve had Caddis and Sulphurs for a solid two weeks now. We’re experiencing typical June water temperatures in May and we’ve seen less hatch activity from Bunkerhill through Big Falls. Evening fishing tends to peak around 7 PM with a late emergence of duns followed by a spinner fall at dusk to dark. Yesterday MD DNR Fisheries Biologists stocked the upper river with 5, 000 fingerling Kamloops strain rainbows. Once established, these fish have the ability to grow at a rate of close to 3 inches a year and will look like the fish pictured below taken by Jason du Pont in just a few years. Throughout the day sporadic hatches of Sulpurs in a range of #12-16 and smaller caddis in the #16-18 range have been keeping anglers busy. Nymphing in the mornings has been very productive with pheasant tails sized #16 and smaller. With bright days ahead of us, look for shaded spots along edges and seams and have fun out there. Thanks to Willy and Bob for the following Stream reports. Thanks for the tip. You saved my Sulphur season. I’ll be back for more as soon as I’m back in town (It was hard to leave). Got to the river around 6 PM and hit the riffles below the boulder pools near the low trail. I like when you can count the number of fish caught by the dozen. I waited to switch to the spinner until almost dark. What’s incredible is that the fish grew by 4 inches when I did. The big boys know to wait for the easy pickings.The poly wing comparadun is bullet proof. I never changed flies, but sure use a lot of frog’s fanny. Saw your latest posting regarding 6 brookies released this year. For what its worth, I have caught a total of 6 brook trout in 9 seasons fishing the Gunpowder. Two were caught this year. The 6 were dispersed all along the catch and release section. Of the two caught this year, one was taken above the mouth of Panther Branch and the other above Falls Road. All were small but beautiful. This entry was posted in fishing report on May 22, 2007 by Theaux Le Gardeur. The Gunpowder river was recently named as one of the top 150 fishing destinations by Field and Stream Magazine. We provided tips for the article and would be happy to provide a fly fishing guide should you need one on the Gunpowder river, or any trout stream located in the state of Maryland. Have a date in May or June in mind?Please give us a call at 410-329-6821 or drop us a line at info@backwaterangler.com to pre-register. This entry was posted in news on May 21, 2007 by Theaux Le Gardeur. If this video short by Jason du Pont is any indication, don’t wait until June to fly fish the Gunpowder River. The Gunpowder is experiencing great hatch fishing throughout the day, but incredible spinner falls and dun hatches in the late evening. The video footage shows a pool of steady, aggressively rising trout. This entry was posted in fishing report, video on May 21, 2007 by Theaux Le Gardeur. You could wait until the fly fishing along the Gunpowder River gets better than this week but then again you might have to wait an entire year to see more caddis mid-morning and sulphurs in the evening. We spoke to the folks at MD DNR Fisheries and the City of Baltimore early in the week and they were very attuned to the needs of the wild brown trout. In short, a gate change was made and there is a little more mixing going on in the wet well between the ten foot and fifty foot levels. So, we have slightly cooler water,(from 63 F at Falls Rd on Saturday to 61 F this afternoon) and in the next week we’ll start to see a Sulphurs a little closer to 4:00 Pm then 6:00. By the way, the river is flowing at 120 Cfs and is on the drop after an evening shower yesterday made for a little more spillover. Try a grizzly and lime Griffith’s gnat in a #14-16 for the Lime Sallies and stick with caddis emergers like Lafontaines and Zing-Wing Caddis in the riffles mid-morning. By afternoon, Sulphur emergers such as Unusuals, loop wings and sparkle duns are a good bet. From dusk till dark try a biot bodied Sulphur para-spinner tied by Mike Bachkosky, they’re easy to see, trick the fish and are still tied in the U.S.. While the Brookie featured in this post was caught on the Savage River last year during a Backwater Angler Overnighter, We’ve had six brookies reported released in the past two weeks on the Gunpowder River. This entry was posted in fishing report on May 18, 2007 by Theaux Le Gardeur.